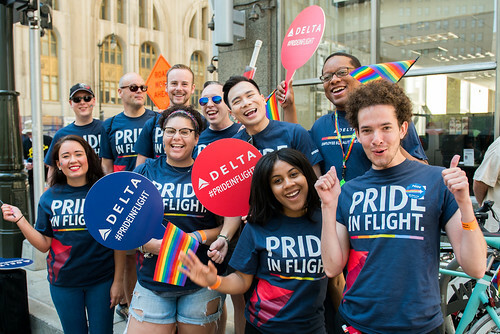 Delta employees proudly rallied behind this year’s Pride events slogan, “Give love wings and let it fly,” along with the diversity, acceptance and inclusion it symbolizes at corporate-sponsored events in June throughout the U.S. and Canada. Delta served as the Official Airline Sponsor with support from Delta's Employee Equality Network (DEEN). Involvement spanned the Boston Pride Festival; Cincinnati Pride; Circle City IN Pride; LA Pride Festival; Motor City Pride; Nashville Pride Equality Walk; NYC Heritage of Pride; Seattle PrideFest; Seattle Pride Parade; Toronto Pride; Twin Cities Pride; and Utah Pride Festival. In each city fellow employees, friends and family volunteers participated in the parades. Many local stations also participated in other Pride events this year. For the first time, Delta served as the Official Airline and sponsor of the Boston Pride Festival, a co-branded initiative with partner Virgin Atlantic. In addition, they partnered to support Seattle and New York City Pride events. They will partner again to support of London’s LGBTQ community next month and Atlanta Pride in October. 16 company-supported Pride initiatives across cities in the U.S., Canada and the U.K.